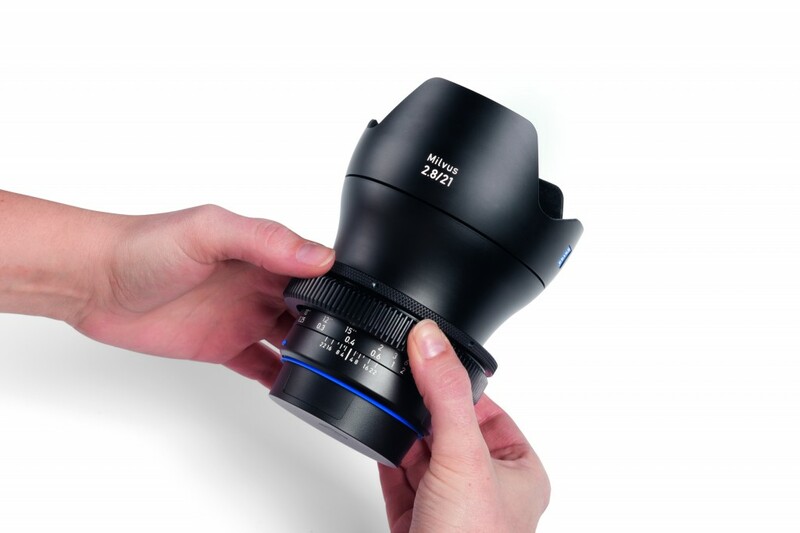 The new ZEISS Lens Gear Rings instantly turn the ZEISS Otus, ZEISS Milvus and ZEISS Loxia lenses into “cinema” lenses by adding follow focus support. Made from premium aluminum with a hardened surface coating, the lens gears come in 4 sizes (mini, small, medium and large), allowing for maximum versatility. No tools are necessary as the gears are easily slid onto the lens and attached to the focus ring simply by turning the two counteracting rings. Each lens gear is supplied with a rubber covered band, the GumGum, which features an adhesive surface. This means the inner diameter can be reduced according to the lens diameter, thus supporting multiple lenses. The GumGum also protects against scratches and other damage to the focus ring of the lens. 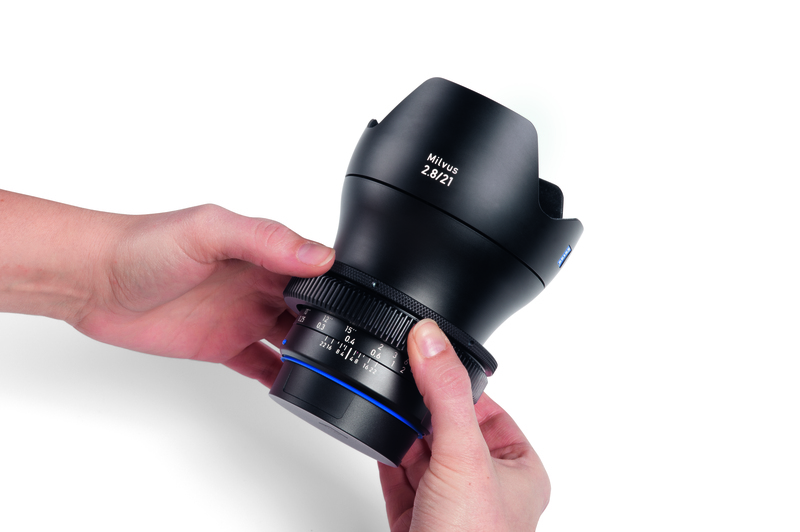 The ZEISS Lens Gear Rings will be available April 21, 2016. Click here for more information. ZEISS has also announced bundles for the Loxia, Milvus, and Otus lens ranges. Loxia Lens Bundles are available in 2 or 3 Lens Sets and include a custom Transport Case with removable soft side bag, ZEISS ND Lens Gears and De-Click Keys. Milvus Lens Bundles are available in ZE or ZF.2 versions and include a choice of 3-6 lenses, with ZEISS ND Lens gears. Otus Lens Bundles are available in ZE or ZF.2 versions in 2 or 3 Lens Sets and include a custom Transport Case and ZEISS ND Lens Gears. Sony has released the CBKZ-FS5RIF $600 Update for the PXW-FS5 and PXW-FS5K that enables 2K and 4K RAW recording via the 3G SDI port out to a compatible recorder such as the Odyssey7Q+ or Atomos Shogun. The CBKZ-FS5RIF upgrade licence allows the PXW-FS5 to output 4K (4096×2160) RAW at 23.98p, 25p, 29.97p, 50p and 59.94p, recording to the AXS-R5 external recorder attached with the HXR-IFR5 interface unit (sold separately), or with a compatible recorder such as the Odyssey7Q+. While outputting 4K/2K RAW to the AXS-R5, it is possible to simultaneously record XAVC HD on SD memory cards in the camcorder’s internal dual media slots. Approximately 4 seconds of cached 4K RAW can be output at 100 or 120 fps as 23.98p, 25p, 29.97p or 59.94p. You can output continuous 2K RAW at 100, 120, 200 or 240 fps as 23.98p, 25p, 29.97p or 59.94p. The CBKZ-FS5RIF RAW Update for the PXW-FS5 and PXW-FS5K requires Version 2.0 Firmware which is now available for download here. This update includes an auto ND function that changes the strength of the electronic ND filter so that exposure can be adjusted without effecting aperture of shutter speed values. There is also expanded zebra function and GPS capability. Firmware Version 2.0 is a free update. Purchase the CBKZ-FS5RIF FS RAW Interface Upgrade License from Texas Media Systems! Canon has pulled the curtain on its newest lens, one that will bridge the gap between traditional Canon EF Photography Lenses and CN-E Cinema Lenses. The Compact-Servo 18-80mm T4.4 EF lens (Preorder here) combines the benefits of compact size and light weight (only 2.7 lbs.) for outstanding mobility. 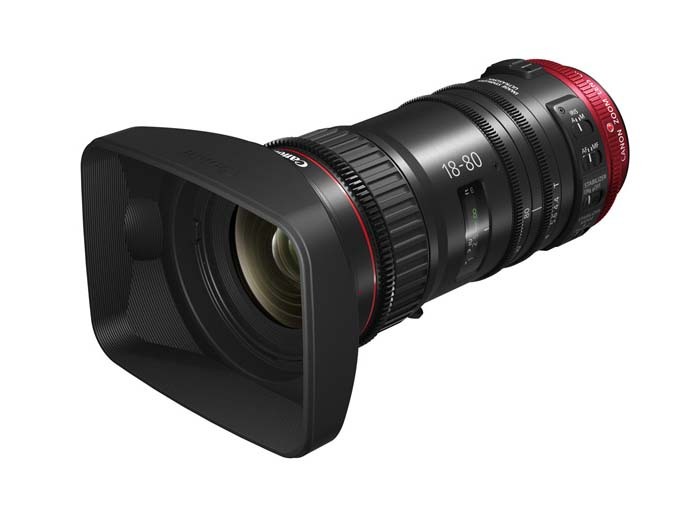 Designed to shoot video, this lens can be ideal for the cinematographer moving up from EF lenses, combining the functionality of Canon’s EF lenses with the video shooting features of Cinema lenses. The Compact-Servo 18-80mm T4.4 Zoom Lens is a cinema-style lens that includes a newly developed servo drive unit and incorporates Image Stabilization and Autofocus functionality. The lens also supports 4K image productions and was designed to be able to be utilized in a variety of shooting styles, including both large and small productions. Canon seems to be targeting C100, C300, C500 users who aren’t able to justify the $20,000-$60,000 for a Cine-Servo Lens. The Compact-Servo 18-80mm Zoom Lens is compatible with EF- mount Super 35mm large-format cameras, and maintains brightness across the entire focal range at T4.4 (equivalent to F4.0). The lens even possesses optical image stabilization, something not normally found on cine lenses. Filmmakers can control many of the features of the lens through the EF-mount communication, including Dual Pixel CMOS AF, push auto iris, record start and stop and remote lens control via the camera with an optional remote control, compensation for chromatic aberration (when paired with the EOS C300 Mark II Cinema Camera), metadata acquisition, and selection of T-number display. The nine-blade iris aperture diaphragm will give footage a “cinematic” look and feel, while providing a “bokeh” effect in out-of-focus areas. An optional servo grip is available (ZGC-C10), which adds ENG-style control and operation. It can even be mounted to the end of a shoulder rig for more versatility and comfort. The Compact-Servo 18-80 is also compatible with other servo grips, such as the ZSD-300D and FPD-400D. Get the most out of your Sony PXW-FS5 with the VariZoom VZ-Rock! VariZoom’s most popular LANC unit offers the finest degree of control and a complete feature set! With its wide-sweep zoom rocker, the VZ-Rock combines the attributes of broadcast controls with a compact, affordable design. Also included are record, focus control, Auto/Manual focus switch, onscreen data toggle, rec search, standby control, and LED indicator. The VariZoom VZ-Rock is compatible with LANC Sony & Canon Cameras. 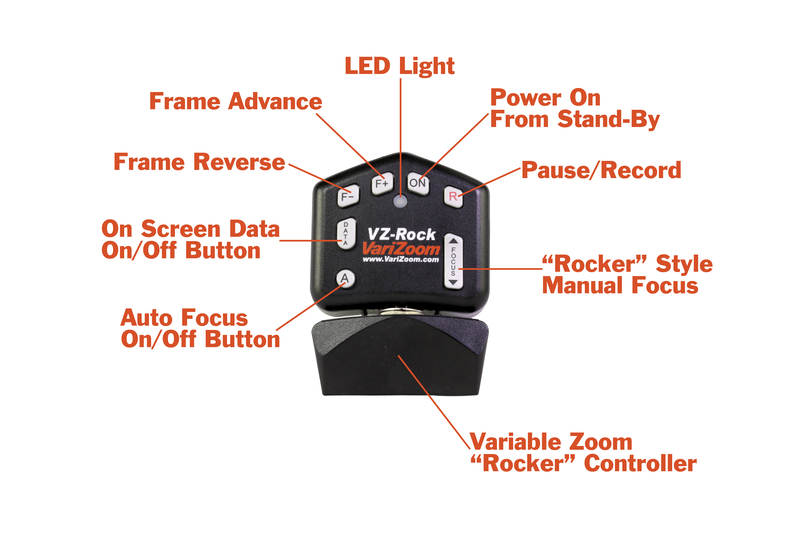 The VZ-Rock LANC camera lens zoom control utilizes a pressure-sensitive, side-to-side rocker switch, much like one would find in broadcast lens controls. This rocker has a greater range of motion for a finer degree of zoom control. Greater control means smoother zooms at more accurate speeds. Maintaining a constant speed is a breeze on the VZ-Rock, producing a more professional-looking result than the standard zoom controls on the FS5! 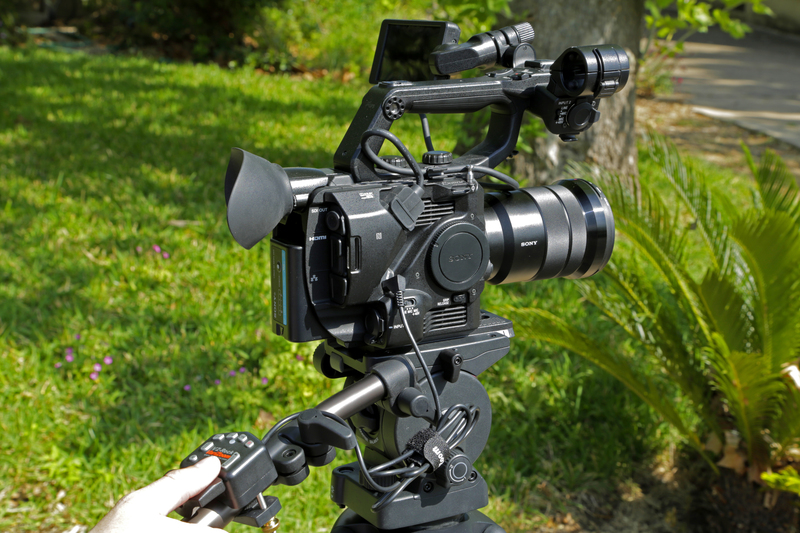 Paring the VZ-Rock with the Sony PXW-FS5 makes the perfect set-up for any type of production. Attach the VZ-Rock to the arm of a tripod, and use it to quickly and easily access many of the major camera functions without having to touch the camera. Zoom in and out, quickly focus your shot, and then press record/pause all from one convenient device! Canon has released Firmware Version 2.0.6.1.00 for the EOS C100 Cinema Camera (with the Dual Pixel CMOS AF Feature Upgrade applied). The new update fixes a phenomenon in which, when specific lenses (EF 24-70mm f/4L IS USM / EF-S 15-85mm f/3.5-5.6 IS USM) are attached to EOS C100 (Dual Pixel CMOS AF) cameras running Firmware Version 2.0.5.1.00, the image stabilization mechanism does not operate even when the lens’ IS switch is in the ON position. Please Note: Firmware Version 2.0.6.1.00 is ONLY for EOS C100 cameras which have Firmware Version 2.0.3.1.00 – 2.0.5.1.00 with the Dual Pixel CMOS AF Feature Upgrade applied. You can download Firmware 2.0.6.1.00 from the Canon website, here. After the Firmware update has been performed, the camera’s menu settings and Custom Picture settings will be reset. Canon recommends that users save their menu and Custom Picture settings as settings data to an SD card, separate from the one that will be used to carry out the update, before starting update operations. This saved data can be loaded into the camera and the settings can be changed after the update has been completed. – Save and unzip the downloadable archive. – Insert the SD card into the camera’s SD card slot, and close the card cover. – Slide the Power switch to [CAMERA]. – After pressing the [MENU] button, navigate to the [OTHER FUNCTIONS] Menu and open the [INITIALIZE MEDIA] submenu. – Select [SD CARD], and then select the slot you inserted the card in to (A or B). – Select [COMPLETE] and then press [OK] to complete the initialization of the SD card. – When the confirmation message appears, press [OK]. – Exit the Menu and slide the Power switch to OFF. Remove the SD card from the camera. – Copy the firmware update data to the SD card. – Insert the prepared SD card into the camera’s SD card slot. – Slide the Power switch to CAMERA. – After pressing the [MENU] button, open the camera firmware submenu by selecting [OTHER FUNCTIONS] [FIRMWARE] [CAMERA]. – The firmware update confirmation screen will be displayed. – When you select [OK], the firmware update will start. – After the update ends, the camera will restart automatically, and a firmware update completion screen will be displayed. – When you select [OK], all settings will be reset and the [DATE/TIME] screen will appear. Set the date/time. – Check that the firmware version has changed to current one. – Exit the Menu, and slide the Power switch to OFF, and then remove the SD card from the camera. 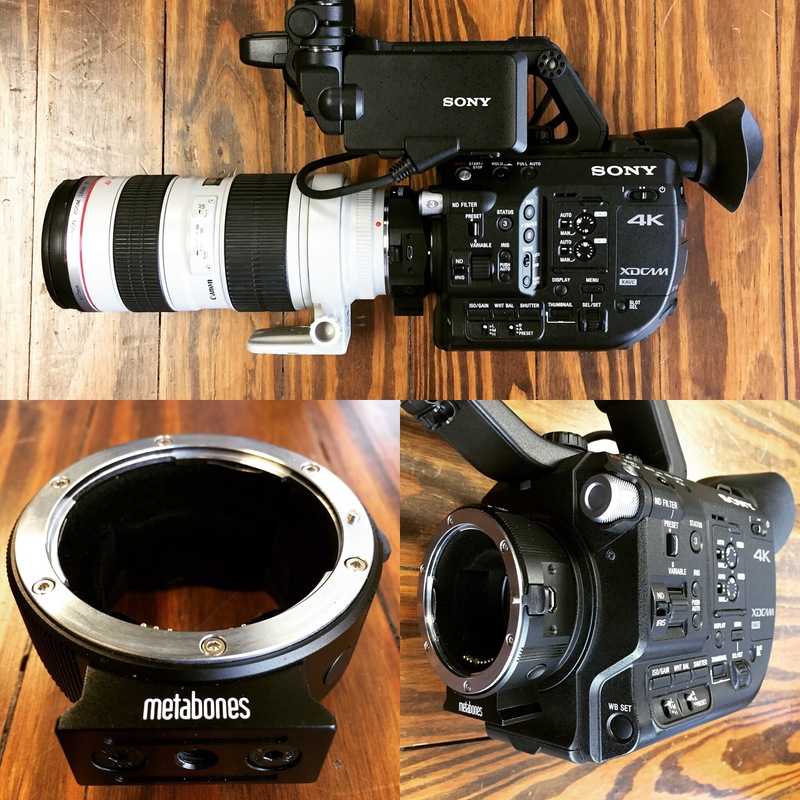 Receive a FREE Metabones Adapter (via Mail-In Rebate) with Sony FS5 or FS5K Purchase! From April 1, 2016 – June 30, 2016 receive a FREE Metabones Smart Adapter (Mark IV), via mail-in rebate, when you purchase a Sony PXW-FS5 or PXW-FS5K Super 35mm Camera. That is a $399 value! The Metabones EF Lens to Sony-E Smart Adapter (Mark IV) allows you to mount EF-type lenses to the flexible E-mount system on the Sony FS5. It has active electronic circuitry to communicate between the 3rd party lens and the Sony camera. No glass is present in the adapter so no light loss occurs.